Registration deadline is 3/15. See the Club Website for more details. Macky May will provide a overview on Spring-time night fishing as well as a brief cast-net throwing demonstration, and Mike Ward will give an update on the latest developments in the world of marine electronics that help to make our task in locating those elusive striper just a bit easier. Watch this space for information on topics to be presented. As in the past, the Smith Mountain Striper Club will staff the Indian Point / Magnum Marina stations for the Lake Clean-up Effort. Cindy Turlington is leading our efforts for this lake-wide community activity. More details can be found on the TLAC Website. Registration deadline is 5/11. See the Club Website for more details. We will once again be posting a group of our nation's finest for a day of "escape" to the beautiful waters of Smith Mountain Lake. We are in the early stages of planning, but watch for more details on how you can get involved in this rewarding event. You can always check the latest calendar of Club events here. Yes, this edition of the newsletter looks different yet again. It certainly looks different than our long-standing "bulletin" format, and a little different than our January newsletter. 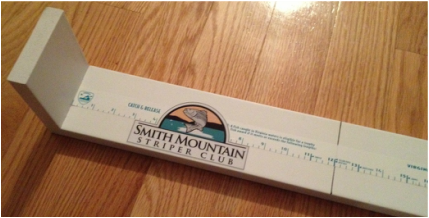 We are continuing to refine the format to optimize to one that is easier to create and publish and allows us to integrate the on-line content which is being published on the Club website (www.SmithMountainStriperClub.com) as well as in print format for those members without Internet access We will continue to fine-tune the format in order to provide you with important and interesting Club information in an easy to read format, but that is also manageable from a content creation perspective. We welcome any thoughts or feedback that you have on the direction we are going - good or bad. And, we also welcome anyone that would like to get involved in generating content for the newsletter - it can be as small as a fishing report, some pictures of a good trip (we LOVE pictures!) or as involved as you would like to be. If you would like to get involved, please contact me at mwardncsu@bellsouth.net or give him a call at 336-437-4114. Also, don't forget to check the Club Website, which is updated frequently throughout the month, as well as our Club Facebook page where late-breaking information is posted. 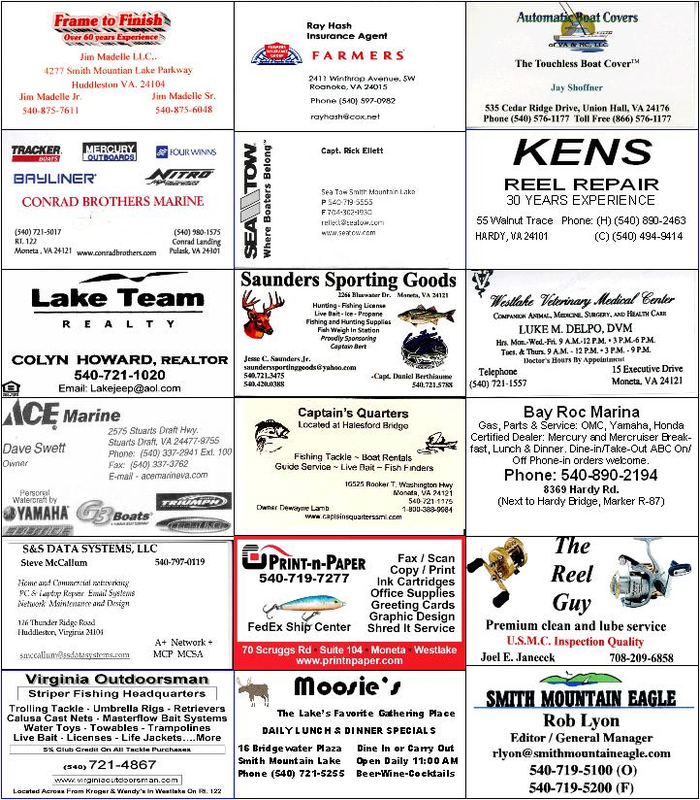 The Smith Mountain Striper Club is pleased to announce our plans for a series of tournaments in 2013. We will hold five Member/Guest tournaments with reduced entry fees compared to years past, and an overlying tournament series for those members wishing to engage in a year-long competition for ultimate bragging rights. This year's tournaments will feature multiple "classes" - an Artificial-only class, an "Open" class (artificial or live bait), and a Children's' class; and we are introducing a Catch-Photo-Release (CPR) model to be used in this year’s tournaments. Based on member feedback, we will not be having cash payouts for placing, but will compete for the fun of individual bragging rights and plaques will be awarded to the top three places in each category. Tournament fees will be $5 for members, $10 for guest and free for children under 18. A member may have one guest participate in the tournament with them as well as any number of children. Each individual may participate in only one class. A "big fish" pot will be offered as an optional component, with 100% payout to the big-fish winner of each individual tournament. 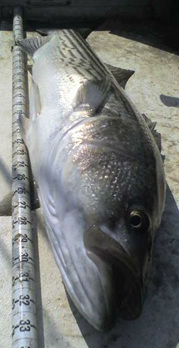 Each tournament will be scored from total length of a 2-fish catch. Members will submit digital photos of their catches with an appropriate measuring device that shows the fish's length, along with a Tournament "Token Card" that shows the "token" for that specific tournament. Under the CPR tournament model, anglers will be able to submit fish inside the slot limit even when the slot is in effect. Anglers have the option to harvest fish within then current regulations should they desire. Two tournaments (in July & September) will be designated as "harvest tournaments" in order to collect fish for a Club fish-fry. The Tournament Series will be open to Club members only. The Series entry fee is $30, which is in addition to the individual tournament fees. The Series fee must be paid at the time of signing up for the series, while the individual tournament fees can be paid prior to the start of each individual tournament. Tournament Series participants will be issued an official measuring device which must be used, along with the Tournament "Token" card, in the measurement and photos of their submitted fish. The angler's two-fish total length from each individual tournament will be tallied and used to rank the anglers in the Tournament Series to determine the winners in each class. Winners of the Series will be announced at the annual Club Holiday Banquet. The deadline for registration for the March 23rd tournament is Friday, March 15th. Additional information, registration forms and tournament tokens (and measuring devices for Series participants) will be available at the March 1st Club meeting. 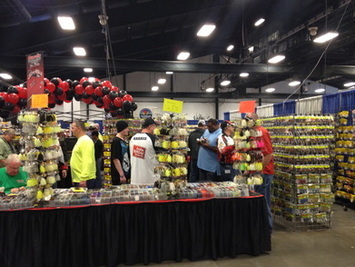 We hope you will join us for one or all of the 2013 Tournaments! Additional details and the full Official Tournament Rules will be published in the 2013 Tournament Rules and posted on the Club's website (http://www.smithmountainstriperclub.com/tournament-info.html) and the Club's Facebook page. Any questions can be directed to this year's tournament co-directors - Rick Boettcher (jrboettcher@cox.net; 540-761-3549) and Mark Melius (mytoyzfishing@gmail.com; 540-597-8710). It is with sadness that we convey word of the passing of Club member Hank Pacey. The Smith Mountain Striper Club sends along our thoughts and prayers to his family. May they be comforted in this time of loss. Hopefully you will remember the issue which was brought to the Club's attention early in 2012 regarding the staffing situation at the Brookneal Hatchery where the striped bass fry which are destined for SML stocking are hatches and grown out. The retirement of the existing hatchery manager left DGIF with a vacancy, which at the time was not allowed to be filled due to a state-wide government hiring freeze. Thanks to the coordinated efforts of the Smith Mountain Striper Club, the SML Chamber of Commerce, TLAC and other area organizations, the Governor released the freeze on this, and several other positions within DGIF. While it has taken quite some time to fill the hatchery manager position, we are please to convey that this position has been filled as of the early part of this year. At this time it is not clear if the hatchery will be on-line and running normal operations for the Spring 2013 hatching season, but certainly having the manager in place is a positive step. Club President, Joel Janecek, will be traveling to Richmond in the coming weeks to meet with Gary Martel of DGIF to discuss the hatchery situation as well as the overall outlook on the management of the striped bass fishery at Smith Mountain Lake, and ensure that our Club's voice is heard. If you have any questions or thoughts which you would like to be conveyed, please contact Joel in the coming days. During the month of March we will be changing the password for the Members-only content sections of the Club's website. An e-mail will be sent out with the new password to all members with current 2013 memberships, and this information will also be provided at our Club meetings. Should you have an issue accessing the Club website or the member-only content, please contact Mike Ward - mwardncsu@bellsouth.net or 336-437-4114. Also, for those of you that are not aware - we have a Club Discussion forum that is an extension of our website. This discussion forum is for current Club members only and is used to distribute updated Club and Lake information, as well as intended to be a place that we can exchange information, fishing reports, tips & techniques or just generally kid around. You can access the Club discussion forum via the Club website - http://www.smithmountainstriperclub.com/discussion-forum.html. You will have to register with a user name (you must use a user-name of the format FirstLast - i.e. JohnDoe). Sign up for the discussion forum and contribute to the discussion! Growing up in the Miami area, it would have been unnatural not to fish. I started fishing for bluegills in the local canals and then moved on to saltwater species when my dad bought a boat when I was about 14. My favorite fishing is still probably the flats and mangrove shorelines of the gulf coast, one of the few things about Florida that I miss. 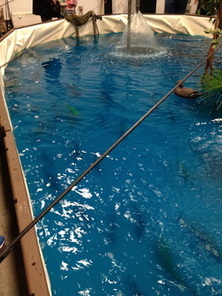 The stripers have filled in nicely though, being a transplanted saltwater fish. I do occasionally fish for other species here, but 98% of the time it’s the stripers. When I’m not fishing I spend most of my time hanging around home with the family and hunting in the fall, and the other necessary things like mowing and home maintenance. I’ve also recently taken up making my own jig heads and bucktails which has been fun. My first couple of years trying to catch stripers was spent trolling for them and for the most part unsuccessfully. I joined the Striper Club in 2007 after learning about it at one of the big bass tournaments. I learned a lot about stripers by attending the meetings, a lot more from hanging around after the meetings and listening and talking to others. I started helping out at the first meeting by helping put away the chairs afterwards and have continued to volunteer at most club functions, even serving on the board, which turned out to be a great way to make friends and fishing connections. Landlocked Striped Bass are the most frustrating species I have ever fished for and I guess that’s why they’re so addictive. I fish out of my JV17 Carolina Skiff and fish primarily artificials, but will occasionally go bait fishing with Macky May. I’ve spent most of my time on the Blackwater side although the last couple of winters on the Roanoke side chasing birds with Don Hutchinson. My favorite time to be on the water is when the schools are breaking on top during the spring and early fall. I also enjoy the night fishing in the winter and early spring. 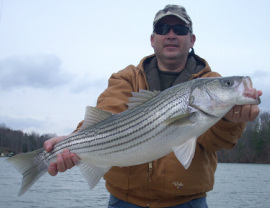 My biggest stripers so far were the 2 citations (37 & 37 ½ in) I caught night fishing with Macky last winter. The Boathouse - 2013 NC Bass & Saltwater Fishing Expo "Review"
The usual regional boat dealers were represented, with Chatlee Marine having their usual dominate space, while other dealer such as Boats Unlimited, Merritt Marine, Anglers Marine, Collins & others all had significant floor space with a good selection of fishing boats representing a number of manufacturers with off-shore center consoles, bay boats, flats boats, bass boats, jon boats, aluminum walk-throughs and even a few "unusual" watercraft options - almost 20 dealers in total were on-site. 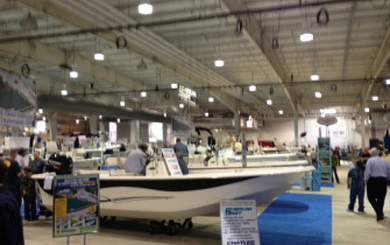 A view across the show floor in the boat building. This year's "headliner" attraction was a Meet & Greet with the stars of the Hilllybilly Handfishin' show on Animal Planet. The BASS Federation had a pitching contest for older children as well as an area for younger anglers to have their hand at pitching to buckets in a simulated pond. The Mountain Trout fishing tank was once again represented giving attendees the opportunity to try their hand at wetting a line to catch a trout or even a catfish. My son Matt & I could not let a chance to fish pass us by, so Matt fished twice and then I had to regain my honor after Matt out fishing me on New Year's eve by catching a nice little trout on a small fly tipped with a kernel of corn. 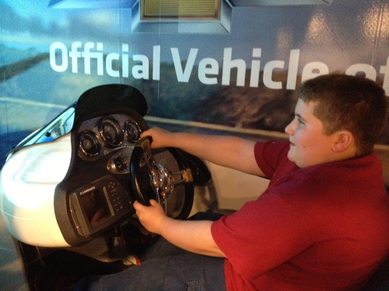 There was even the opportunity to test-drive a bass boat at the show - OK, it was not a "real" boat, but rather a bass boat simulator sponsored by Chevy, but it was a fun activity for my son to enjoy - though I do not want him to get TOO comfortable with a bass boat. Where's the center console simulator? Now, it is a well known law that you cannot attend such a show and not purchase something while there. As my "BIG" purchase was made back in 2010 at this show (my boat), this year's purchase was much more conservative, totalling around $8 and consisted of some split-rings & swivels to rig up some jig-heads I had back at the house to make sure I was topped off for the rest of the winter jigging season.